The job of a project manager can quickly become one of disaster recovery if you don’t have a process in place to complete projects efficiently. And as you research different process improvement methodologies, you might want to consider PRINCE2, an approach constructed in 1989 by Central Computer and Telecommunications Agency and currently used by the UK Government. PRINCE2 is an acronym which stands for PRojects IN Controlled Environments. 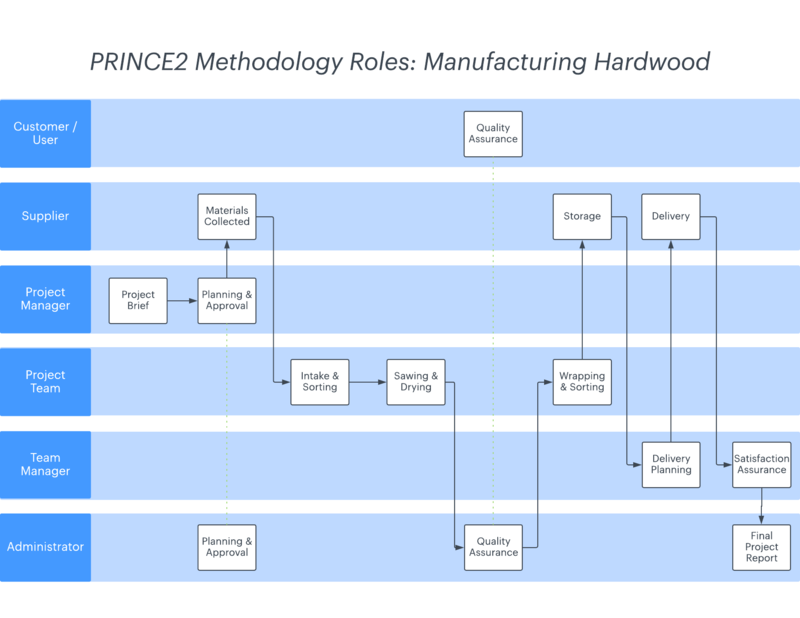 (The original PRINCE methodology was updated in 1996, hence the “2.”) Its framework requires projects to have organized and controlled starts, middles, and ends. Throughout the project (not just at the beginning), you should think about the project’s return on investment. Determine whether the benefits outweigh the cost and risk and how likely it is that the project will result in those benefits. Teams keep a lessons log, where they report lessons learned from their projects and avoid repeated mistakes. Everyone involved in the project should understand their responsibilities and the responsibilities of others. We’ll talk more about roles within PRINCE2 methodology in a moment. PRINCE2 breaks a project up into more manageable stages. At the end of each stage, teams can record lessons learned and evaluate whether the project is on track. The project board (senior managers) initially determines time, cost, and other project requirements and then leaves day-to-day management to the project manager. If issues arise that impact the requirements, the project manager would inform the board. The team should always focus on meeting project requirements and keeping the quality high. You don’t have to live PRINCE2 to the letter. Adapt the method based on the size of the project, the size of your team, etc. The PRINCE2 method allows for better control of resources and better business and project risk management. PRINCE2 identifies who should be involved in the project and in what capacity. If a project does not adhere to these basic principles, then PRINCE2 is not the right way to manage the project. 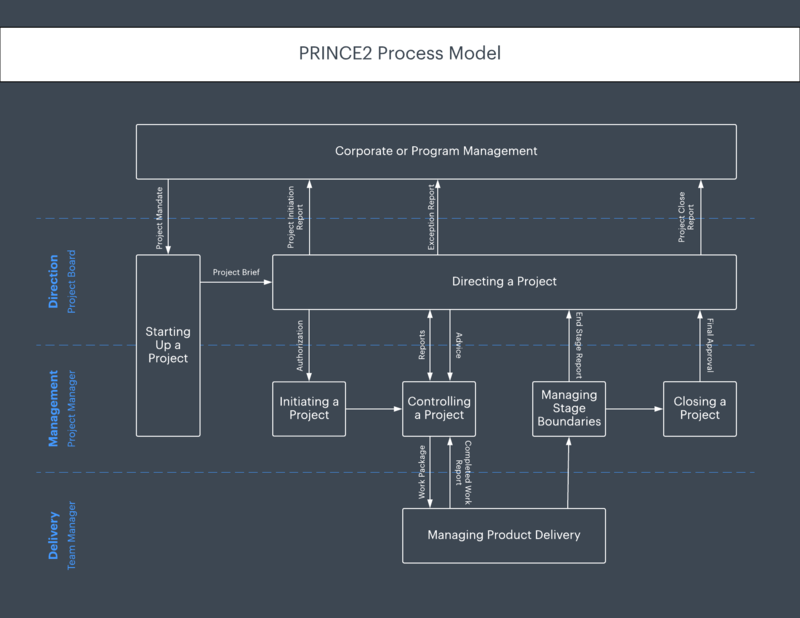 In keeping with the seven steps, there are seven different stages of a PRINCE2 project. Create a project mandate that includes a brief explanation of achievable goals and the necessity of the project. Have the mandate assessed. If approved, create a more detailed project brief. The project board discusses the expanded project brief. If it's approved, they then identify all needed resources and delegate to the project manager. The project manager creates a plan and timeline for the project. They include checkpoints for six targets: time, cost, quality, scope, risk, and benefits. Divide the project into smaller tasks and assign them to the team manager and project team. The project manager will monitor progress and make changes as needed. Compare the project’s progress to the original project brief. Review completed project tasks. The project board will then give approval. The project board and manager review every stage of the project for quality and adherence to the plan. The review is a chance for the project board to decide to move to the next stage of the project or pause progress altogether. The project board will give final approval once deliverables are met. The project manager will complete any remaining documentation and reporting. There are three primary roles within a PRINCE2 method project: the project manager, the project team, and the project board. The project board consists of the customer, the end user, and the supplier. The customer: Whoever is paying for the project. The user: Anyone who will use deliverables or will become impacted by the project’s outcome. In some instances, the user and the customer could be the same individual. The supplier: An expert whose knowledge and skills are needed to create the final product. The project manager: The individual who organizes the projects, delegates work/assignments, and keeps the project on schedule. The project team: The group that does the actual work and completes project tasks. The team manager: The leader of the project team and reports to the project manager. The administrator: Owns all documentation, meeting schedules, and overall project facilitation. Depending on the size of the project, the admin role could be assumed by the project manager. Use our swimlane process map template in Lucidchart to help your team understand roles and responsibilities. Keep detailed records throughout the life of a project. Use them to check deliverables, report/communicate to the project board, and serve as a roadmap for when and where to make changes. Business case: A document that explains why the project is necessary and what benefits end users can anticipate. Risk register: A stock of potential risks, their probability to occur, and anticipated impact. Quality register: A record of quality assurance checks performed during the project. Issues register: A running log of concerns and/or problems observed by project team members. Lessons log: An account of lessons learned from the project that could be applied to future projects. Daily log: A daily record kept by the project manager detailing project progress and activity. The best way to fully understand PRINCE2 methodology is to apply the steps to a project of your own. Various PRINCE2 training, qualification, and certificates are available. Frequent process review throughout the life of a project leads to stronger results. Lucidchart has customizable templates that relate to PRINCE2. Use them to help your team understand the PRINCE2 project management process.